For this year’s Spring Break, my family and I decided to spend the vacation taking a cruise. Not just any cruise…but a Star Wars cruise! Actually it was a vacation on the Disney Cruise Line ship Disney Fantasy and on one of the days at sea, onboard festivities were devoted to Star Wars. 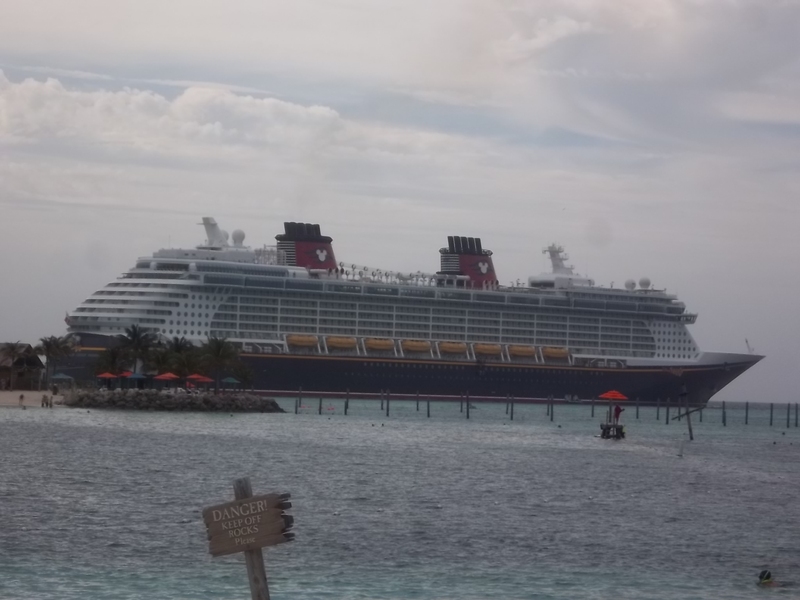 The cruise by itself was fantastic with impeccable service and amenities, in short, a Disney cruise is well worth the money and despite it not being a theme park visit you do feel the Disney experience. The icing on the cake for myself, however, was the Star Wars aspect, of course. 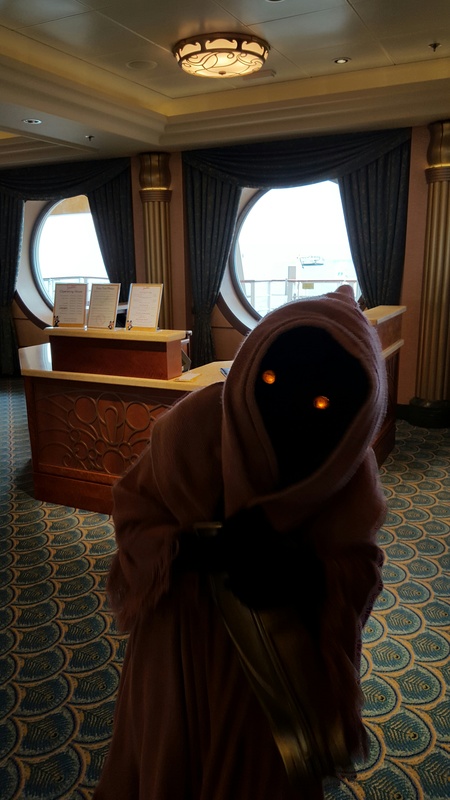 Even though the Disney Fantasy was themed after all things Disney, the presence of Star Wars was felt throughout the cruise even before the Star Wars Day at Sea. 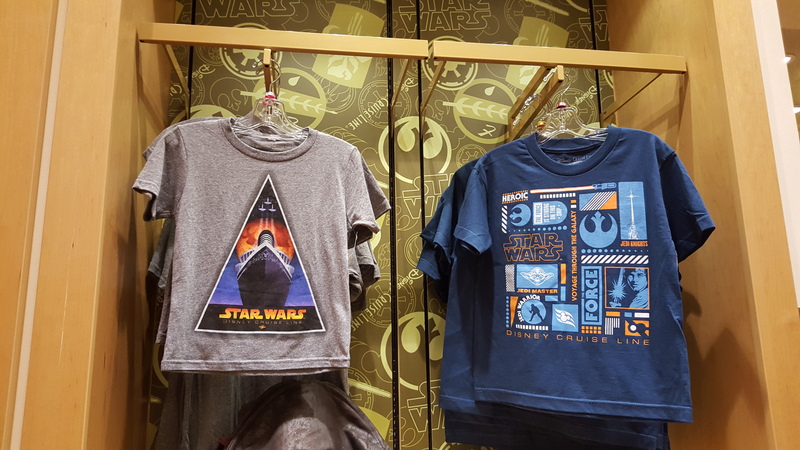 For starters there was the merchandising; the gift shops sold the typical Star Wars toys and paraphernalia that can be found just about anywhere on the planet. However, the stores did have moderate to expensive clothing, accessories and other keepsakes like art printings, t-shirts, shoes, magnets and bags. Then there were other collectibles near the ship’s theaters. The Disney Fantasy has two theaters that played live musical productions and films as well. Of interest to fans was that the entire Star Wars saga was shown at various times throughout the cruise. It was a lot of fun sitting down and watching the films again on the big screen with like-minded audiences while munching on popcorn. 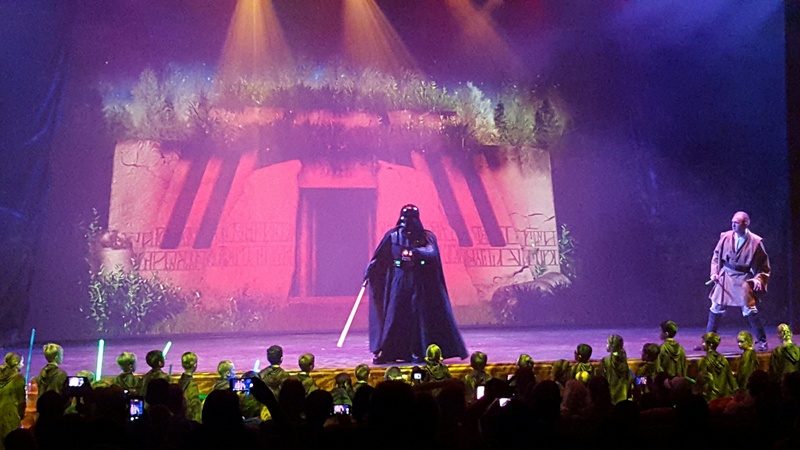 During the actual Star Wars Day at Sea, the Star Wars property took center stage, which was on a Wednesday, the halfway point of the cruise vacation. Throughout the Disney Fantasy, iconic music from the films were played and the ship’s horn blared out the infamous “Imperial March” at certain times of the day. Many passengers were decked out as their favorite Star Wars characters. Several took part in a costume celebration where they got to mingle with other fans or with the Star Wars characters that patrolled the ship. The characters were well done and looked authentic, but more importantly stayed in character. For instance, Jawas popped out of nowhere near the atrium and tried to steal jewelry and other personal effects from passengers (it was all in good fun, mind you). Villainous characters like Darth Maul or Boba Fett silently intimidated passengers as they posed for pictures. However, Darth Vader took the prize for the most authentic recreation. Not only was the costume spot-on perfect, but he actually spoke to one young member in my party with James Earl Jones’ distinctive voice as he mocked the rebels. On the Star Wars Day at Sea both theaters hosted Star Wars-related events. At the Walt Disney Theatre, for most of the day the production/attraction seen at Walt Disney World and Disneyland called Jedi Training: Trials at the Temple was shown. This is the one where a Jedi Knight teaches young Padawans on how to use the Force to defeat Darth Vader (who also appears and fences briefly with each youngling). The other theater, the Buena Vista Theatre, presented a Guest Speaker Series featuring Joel Aron, the special effects guru for Star Wars Rebels. The same theater also had a Star Wars-related PowerPoint presentation called Star Wars 101, which actually helped members of my party get caught up on the intricacies of Star Wars and was presented with lots of enthusiasm. This fervor for Star Wars continued throughout the day at the children’s only sections that played Star Wars Rebels in the Oceaneer Lab that also had Star Wars-themed activities available. Don’t think however, that Star Wars activities were only for the young ones and the adults, at Vibe, those fortunate enough to fall in between ages 11 and 14 were able to play Star Wars Battlefront. The Star Wars celebration continued later in the day with the premiere showing of Star Wars: The Force Awakens and during dinner held at 5 and 8pm. The dinner was something to be remembered. The servers were all too eager to show off the special 3D Star Wars menus that boasted many Star Wars dishes. The appetizers we shared had long names like the Mos Espa Grand Arena Tailgate Sandwich (small Brioches with ham and marmalade) and Bantha Steak Empanadas. I had Lord Vader’s Nerf Stake (rib eye steak with garnish), while others in my family had Qui-Gon’s Crisp Chicken (fried chicken and garnish) and Stormtrooper Cheese Pizza. It was all delectable and filling. 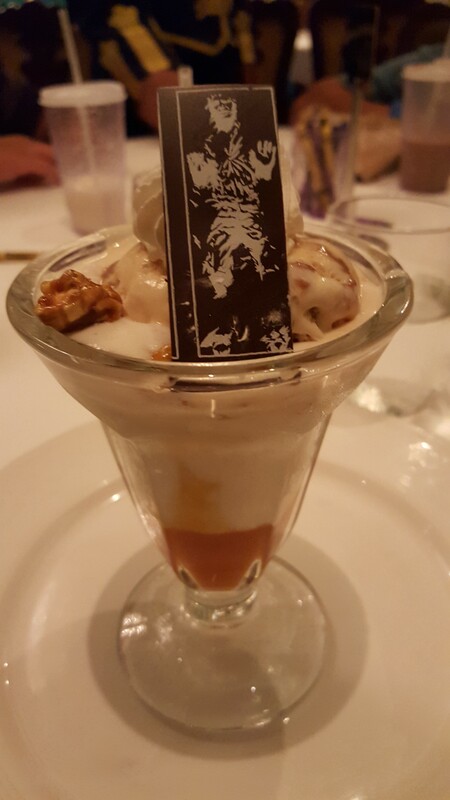 For dessert, I barely had room to finish off Han Solo’s Frozen Carbonite Sundae, which was vanilla and caramel ice cream with caramel popcorn and whip cream. It was as scrumptious as it sounds and actually it would not surprise me if this menu was a test run of sorts for what will be served in the coming Star Wars Land in the theme parks. 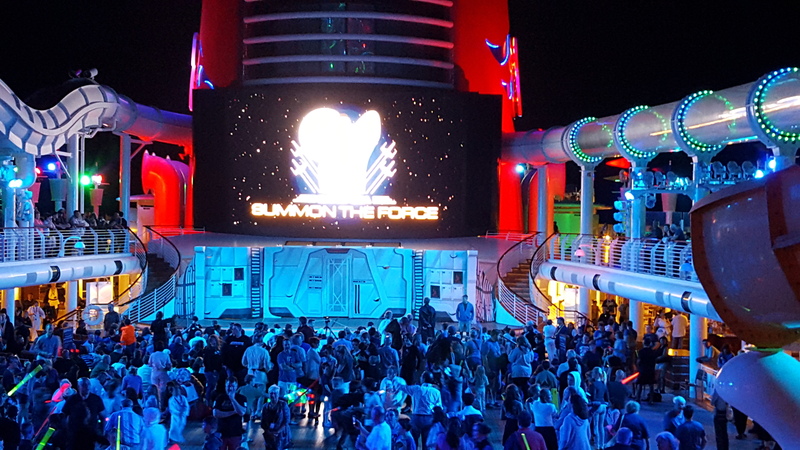 The night concluded with Summon The Force, a stage show held outside on the top deck of the Disney Fantasy. During that show, many Star Wars characters appeared on the stage as a huge screen behind them played clips from the films and the Star Wars cartoons, Star Wars: The Clone Wars and Star Wars Rebels. The presentation finished with a firework spectacle accompanied to John Williams’ majestic Star Wars score and later a dance party in the same location. By this time we were all exhausted from our day at sea and sadly when we woke up the next morning, the hoopla was over. Still, it was great to experience and we all hope to do it again soon. 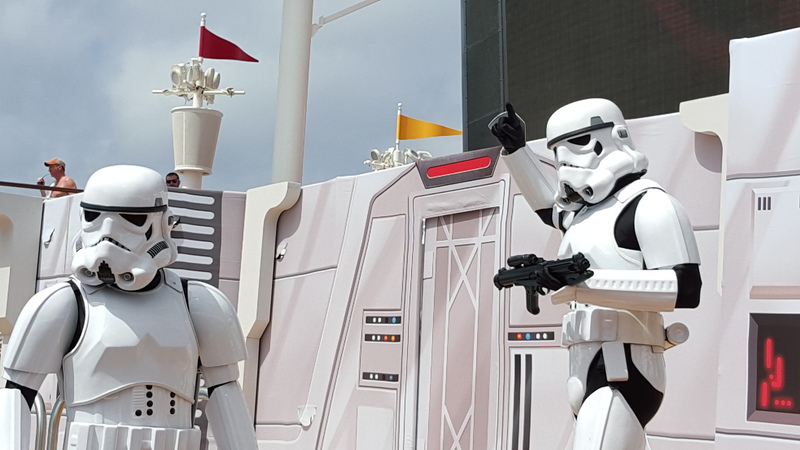 These Star Wars Day at Sea festivities should be offered more often and Disney Cruise Line should also consider doing a Marvel Comics-based festivities as well. So, if possible make it a point, especially if you are a Star Wars fan, to take one of these cruises. You’ll be glad you did. It was a lot better than I expected!